Champion Stories. Backed By Science. The Truth About Dairy Revealed. The Switch4Good team is on the road, bringing entertaining and educational events, networking opportunities, and plenty of mouthwatering plant-based food to your hometown. Through this grassroots initiative, we are creating positive change and lasting relationships with attendees. At each stop, we’re teaming up with local dairy-free leaders including elite athletes, doctors, and restaurant owners to offer well-rounded events that will entertain, engage, and excite audiences about the dairy-free lifestyle. These events will feature rich, intimate stories told by local legends, followed by a science-based educational panel and an opportunity for the audience to get involved. 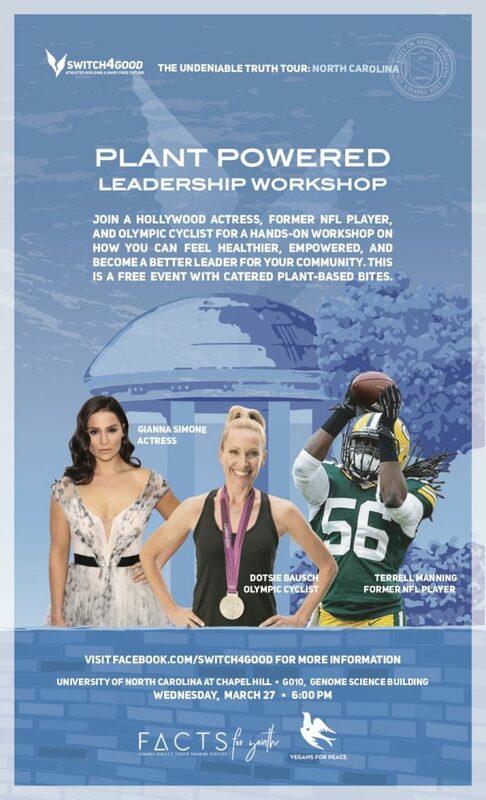 We’re also holding events at high schools and college campuses as part of our Plant-Powered Leadership Workshop. Through these young adult-focused events, we inspire leadership and healthy eating habits among the younger generations, empowering them to make conscious decisions as consumers and giving them the tools they need to follow their passions. Keep an eye on this page to see when the Undeniable Truth Tour will be stopping by your hometown! Want to host a Truth Tour in your hometown? Email us at info@switch4good.org and let us know how you would like to get involved.